FULL-SCREEN MODEMODE: Click PLAY, then pass your mouse over the bottom right corner of the video screen. The outline of a square will appear. Clicking on it will toggle Full Screen Mode. Press ESC to return to the original format. Note: Google Earth software reads the actual topography and ignores roads, cuttings, tunnels, bridges and excavations. The Google Earth vertical-profile animation generates a number of parallax errors, so the profile is only a general guide of what to expect in terms of gradients, distance and elevation. The graph may present some impossible and improbably sharp spikes, which should be ignored. Getting there: To approach from the northern side, the pass can be accessed off the R407 about 4 km south of Prince Albert. It is clearly signposted and easy to locate. Head south on the R328 for 2,3 km where the road crosses the Dorpsarivier via a concrete bridge. 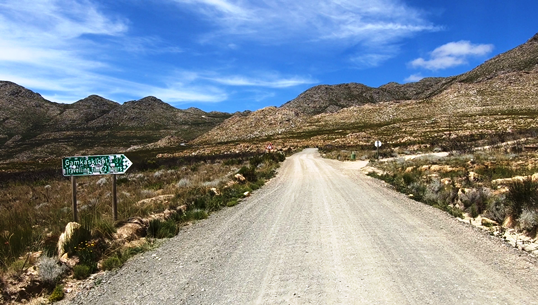 This point marks the northern start of the Swartberg Pass. This is the direction in which we filmed the pass. Eerste Water in the northern sector of the pass makes for a perfect spot / Photo: Trygve RobertsFor those wanting to approach from the south, there are a number of options, but we will describe here the obvious main route. Drive north from Oudsthoorn on the tarred R328 via Schoemanskloof. Just after the Wilgewandel Guest Farm (with the camels) there is a fork in the road. The right hand fork heads directly to the Cango Caves. Turn left here (GPS S33.402020 E22.216309) The road (still tarred) heads east for a further 13 km where another guest farm is reached called 'Cobus se Gat'. This marks the southern start of the pass. The road becomes gravel after a further 2 km. The nearest town is Prince Albert - just 4 km from the northern end of the pass. There is plenty see, from flora to fauna, and some mind boggling geology. The fynbos is at its best in winter and spring with proteas, ericas, restios and pin-cushions in profusion. 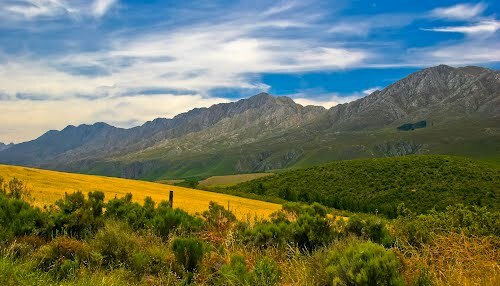 The pass is a national monument and, like its sister pass (Montagu Pass), stands in proud defiance of modern technology. It would be a shame if these roads were ever tarred as their core charm would be lost forever. A plaque commerorating the efforts of the men who built the pass was unveiled on the pass's centenary celebrations in 1988. It stands at the western side of the road at the summit. This was the last pass that Thomas Bain built in the Cape and it was surely his opus magnum. The final cost of the pass, including a few kilometers of access roads, was 14,500 Pounds Sterling, excluding the value of the convict labour, which was free. From the northern start at the crossing of the Dorpsrivier, the road traverses a short stretch of open plain, but the massive bulk of the looming Swartberg blocks the way ahead, other than a single, narrow gorge through which the road winds. The highest peak visible at this stage is unnamed at 1532m on your left (east), whilst the slightly lower Voetpadsberg on the right (west) tops out at 1402m. Amazing geology on display in the northern sector / Photo: Trygve RobertsA low dry packed wall appears on the left as the mountains begin hemming the river and the road in. These walls are the first of hundreds of such examples that you will see along the length of the pass. They were the work of Thomas Bain, then at the height of his engineering prowess as a road builder. The small river, which appears as a docile litlle stream, becomes a raging and destructive torrent when flash floods occur. During the night of April 10th, 2017, such a flash flood, swept down the kloof, destroying everything in it's path. Thomas Bain's retaining walls, which had been standing guard against the river for 130 years, buckled under the might of the river and the 2 km section of road from Malvadraai through to the northern exit of the poort were completely devastated. It took modern equipment and techniques almost 10 months to repair most of the damage, taking due care to rebuild the wallls to appear as close to Bain's original work as possible. 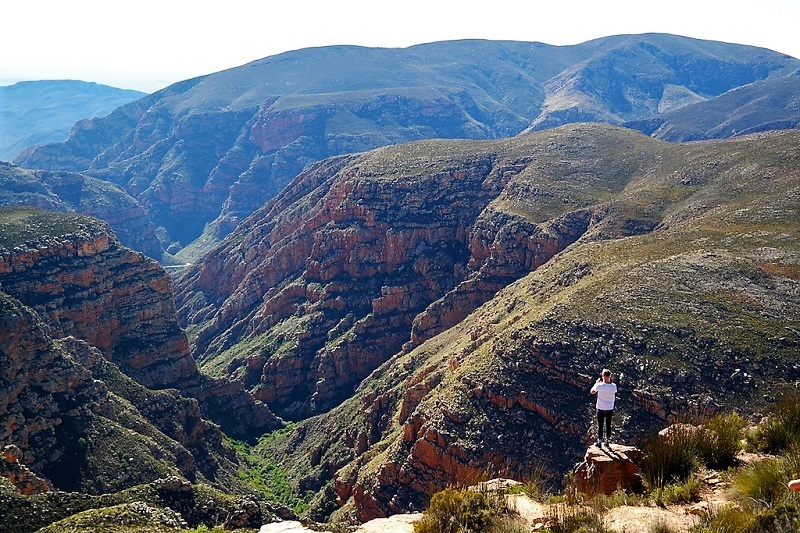 The Swartberg Nature Reserve is large - (180,000 hectares) and provides hiking, picnicking, 4x4 routes, bird-watching, swimming and just being close to nature. 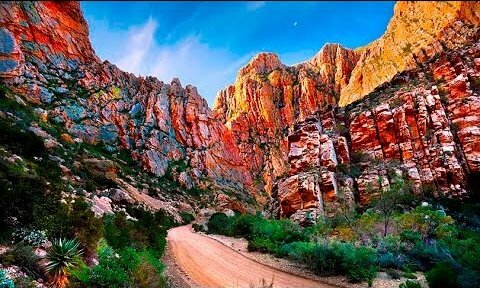 The majority of the pass falls within the control of the Swartberg Nature Reserve / Photo: SA VenuesThe moment the kloof is entered, the sunlight is blocked off and the mountains tower vertically up on either side of the road in a dazzling display of contorted sandstone. The rocks often appear blood red, depending on the time of day. The photographic opportunities are endless and there are enough places to pull off the narrow roadway and park safely. Some bluegum trees appear on the left and a clearing pops up on the right - a large flat clearing where some ruins are evident. Apparently the house was used by Bain as a work station during the construction phase. Immediately after the clearing, the road bends sharply to the left and approaches the second river crossing via a concreted drift. This is normally shallow and should present no problems for any vehicle. This lovely spot is known as Eerste Water (First Water) and was the first point where oxen and horses could be watered, before tackling the big climb to the summit. There is a rock near this spot - a tall thin slab of rock, which looks like a clock. There is lots of shade at this spot and it makes for a great picnic spot and is well protetcted from the wind too. The pass in the 1800's with its designer - Thomas Bain / Photo: Swartberg Mountain ToursOnce over the river, the road bends to the right and follows the eastern bank of the river. The road has been hewn out of the mountain here and is very narrow. If you meet an approaching vehicle, one of you will need to reverse to a wider section to facilitate passing. Soon the road crosses the river for a third time, this time via a low level concrete bridge, which is called Tweede Water (Second Water). Around the next corner is another excellent picnic spot, named Malvadraai. (Wild Geranium Corner) - so named for the wild geraniums that grow there. The section from Tweede Water to Malvadraai also got severely damaged during the 2017 flood. On the left hand side (east) of the river, you will notice a footpath snaking up the mountain-side towards a saddle. This is the 6 hour Malvadraai Hiking Trail and is apparently a lot tougher than its gentle name suggests. Malvadraai is a rest area next to the river, where one normally finds wild geraniums at any time of the year. The river is spotlessly clean and this is a good spot to have a swim on a hot summers day. The road now enters a series of S-bends, and swings away into the south-west up a major kloof, known as Mullers Kloof. This kloof also gave Bain the most trouble. In May 1885 a devastating flood swept across the Swartberg Mountains, washing away most of the road in the adjacent Meiringspoort and causing a long closure. Bains' brand new road also suffered damage, but Bain learned his lessons well and rebuilt the damaged sections of road further away from the river's flood levels. The road also begins climbing more steeply here, reaching a gradient of 1:9. At the 4,4 km mark, there is a layby on the right, which allows access to the ruins, marked as Blikstasie. These ruins were once the convicts home, who constructed the pass. Access to the ruins is awkward and requires some physical effort. Shrubs and trees have overgrown the ruins, but if you have the physical capacity to scramble the few metres up the slope, you will be rewarded with a perfect view of the old walls. These are approximately 2ft thick and consist of rocks and stones held together by mud. The building apparently had an iron roof, hence the name Blikstasie (Tin Station). 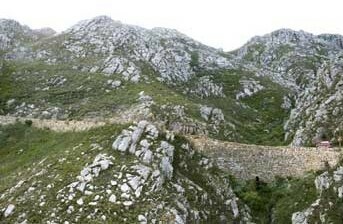 From the ruins, if you look up the slope to the left of the road, you will get perfect views of the massive retaing walls that support the road ascending up Mullers Kloof. These are the most impressive of all the walls and at places reach a height of 13 metres! This is also the kloof that was featured in the TV commercial with well known South African singer, song-writer, playwright and actor - David Kramer, chasing his beloved Volksie Bus up one of the hairpins in his trademark red "veldskoens". The road climbs steeply into the south-west towards a huge slab of exposed and contorted rockface. It is marked as Droe Waterval (Dry Waterfall) as most of the year this riivulet is without water. If you get to drive this pass around sunset, this rock face glows a deep and fiery red in the setting sun and has earned itself the nickname of "Wall of Fire"
Here you are likely to see baboons and klipspringers, the latter which seem to float up the mountainside with no apparent effort. If you have the time, you will see that as part Bain's dry-walled roads, he constructed underground tunnels to disperse flood waters. The man was a genius and way ahead of his time. An example of this work can still be seen at the "Droe Waterfall" which is mostly just a trickle (and aptly named), but when the heavy rains arrive, the gorge is filled with a destructive torrent of white water, capable of sweeping away even the largest of rocks. At Droe Waterval the road curves sharply through 120 degrees to the left and climbs steeply in the process, reaching a gradient of 1:8. 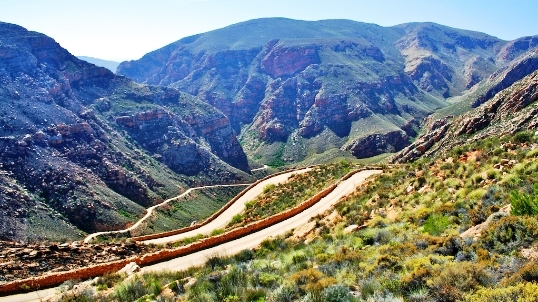 Coming up are the famous four hairpins that feature in so many photos of the Swartberg Pass. Drive slowly and carefully and be constantly aware of approaching traffic as the road is narrow here and both vehicles will need to move as far left as possible and pass each other at a crawling speed. Some drivers get so engrossed in the scenery that they forget to keep left. Be constantly aware of meeting an oncoming vehicle on the wrong side of the road. There aren't many places to pull over safely, but there is one good spot right before the third hairpin, which allows a wide scope for photography. It's a great spot to stop and breathe in the clear mountain air and savour the majesty of the impressive landscape. 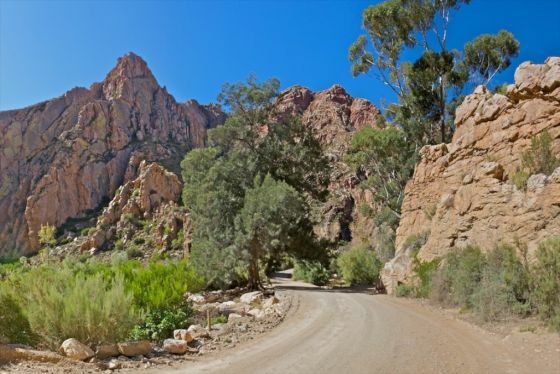 This is one of the Top 5 highlights of the Swartberg Pass. Once up onto the ridge, the gradient eases off a bit to around 1:14 and follows the spine of a long ridge, as the road climbs inexorably towards the viewsite known as Teeberg. The road is wider here and passing oncoming traffic is easier. The Teeberg viewsite is located at the apex of a very sharp right hand bend of 160 degrees. It's at an altutude of 1394m exactly 9 km from the northern start. There is a concrete picnic table here and sufficient parking for about 6 vehicles. The name Teeberg does not appear on any of the topographical maps and the mountain spine that leads upwards terminates at 1535m and is actually called Platberg. Looking north one gets a majestic view over the 500m deep chasm that runs all the way down to Malvadraai. The views are quite amazing and if you arrive at this view site on a wind free day, it is a marvellous place to find your soul. The views are 360 degrees and offer so much variety that it's almost impossible to take it all in. Cautionary: There have been a few incidents on this pass, where people have left there vehicles to take a photograph and not fully applied the handbrake and in one instance, not at all. A minivan rolled almost 400m down the cliffs and was obviously a total write-off. Luckily the occupants were out of the vehicle at the time. When stopping at any of the viewsites, it is best practice to switch the engine off, engage 1st or reverse gear if manual, and PARK if automatic PLUS fully apply the handbrake. There are baboons, grysbok, grey rhebuck, klipsringer, leopards and caracal - with the last two seldom being sighted. The road is narrow in certain sections and some reversing might be required to get past an oncoming vehicle. Etiquette is to give way to the ascending vehicle. There are no heavy vehicles or caravans allowed. Drive at the speed limit or slower - this road can be dangerous in bad weather. If you plan on stopping at the top for a photo or two, have a windbreaker ready - it can be ice cold out of the car and almost always windy. From Teeberg the road heads due west as it skirts a side ravine and maintains a fairly level altitude. At the 9,9 km mark, there is a sharp left hand bend, which changes the direction into the SSE, as a flatter section of the upper plateau is traversed. Here the mountain slopes are covered in dense stands of proteas and ericas and if you visit in winter or spring, you will be richly rewarded. The road starts climbing again at a gradient of 1:16 and an intersection is reached at the 10,8 km mark, with another gravel road heading away into the west. This is the turn-off to the famous Gamkaskloof . It is not recommended to drive this road unless you are well prepared, have sufficient fuel, knowledge, and preferably have booked accommodation overnight at Die Hel. This road is slow and a lot rougher than the Swartberg Pass. CAUTIONARY: Do not drive this road (Gamkaskloof/Die Hel) unless you have a high clearance vehicle and preferably a 4x4. It is a minimum of a 4 hour trip there and back excluding any stops. It is far better to prebook accommodation at Die Hel and overnight there. The road is a dead-end and consists of about 9 small passes and one big one at the end (Elands Pass). You will be doing this route an injustice by attempting to drive it in a single day. This road is much rougher than the Swartberg Pass. 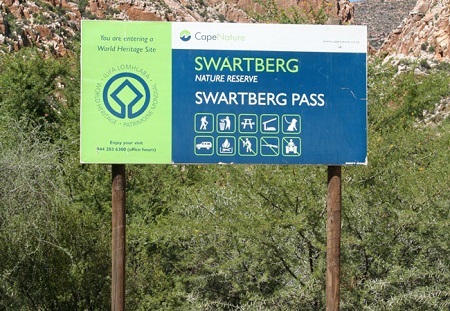 Sign at the summit now obliterated with stickers / Photo: Sncdn.comAfter negotiating another big right hand bend of 140 degrees and at the 10,8 km mark, the buildings of the old toll house and Swartberg Nature Reserve appear at the next bend. These are used by hikers tackling the Swartberg Hiking Trail. The road now swings through another big S-bend which brings the heading into the east, as the next set of switchbacks begins at the 12,4 km point. You will also notice a locked and gated jeep track heading eastwards just after the picnic spot. This is a known 4x4 route which is some 75 km long. Permits can be obtained from Cape Nature and/or the Swartberg Nature Reserve. There is a minimum number of vehicles required per trip for safety reasons. Immediately before the jeep track junction, some green roofed buildings appear on the left of the road, almost directly below the pass summit. This was originally the site of the road camp where the convicts were housed and perished that snowy night 120 years ago, when their roof caved in. Today, the buildings have been restored and serve as an information centre for the Swartberg Nature Reserve, as well as an overnight hikers hut and a tearoom. The next set of switchbacks consists of four hairpins and whilst they are most impressive, they are not quite in the league of those in Mullers Kloof. The road is also not so narrow and there are more opportunities to stop for sight seeing and photography. Looking south from the summit of the pass / Photo: BlogsausbettiesThe third hairpin changes the heading into the west, as the final pull up to the 1575m summit is tackled. Be prepared for cold, blustery conditions at the summit and be aware that there is limited parking. A sticker plastered sign announces: '"DIE TOP". This is not the optimum view site on the pass and the weather often spoils things as the wind can really howl through the neck, often reaching gale force conditions. It is much better to stop at one of the three viewsites along the southern descent. 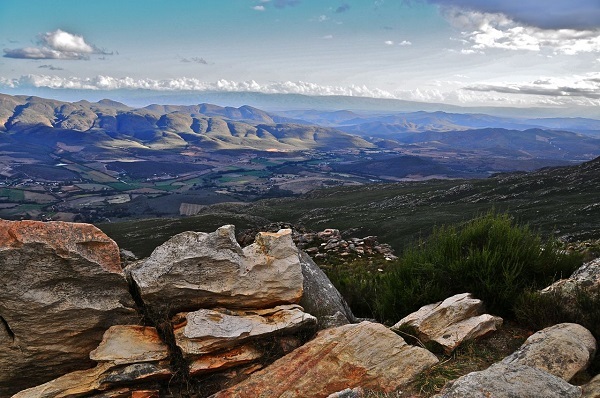 From Die Top, which is a natural saddle in the mountain, you will have expansive views to the south of most of the Klein Karoo, with it's patchwork of green farmlands, whilst the northern vista is entirely different, displaying much drier mountains with a massive gorge splitting the upper mountain plateau into two. It is along the western side of this gorge, that the road has delivered you. From the summit point, the road can be visually traced all the way back to Teeberg. If you are lucky enough to be at the summit alone, switch your car's engine off and listen to the incredible silence or the wind whistling past the rocks at Die Top. The moment the road curves through the sharp left hander at the summit, huge views of green fields and distant grey mountains open up. It is completely different to what has been on offer for the previous 40 minutes. All along the descent there are wonderful examples of Thomas Bain's perfectly constructed dry packed walls. Perfect examples of the dry packed supporting walls on the southern side / Photo: PanoramioThe descent is mainly into the east and other than dozens of bends, corners and curves, this direction is maintaned all the way to the valley floor. Maintain a slow and steady speed and make sure you keep well left on all the blind corners. 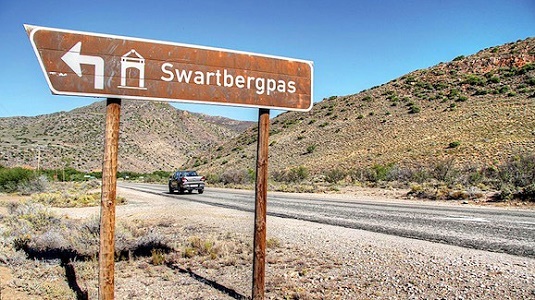 CAUTIONARY: The Swartberg Pass is enormously popular with both local and international travellers as can be attested by the many hire cars that can be seen on the pass 7 days per week. Tourists tend to drift completely onto the wrong side of the road as they take in the grand scenery. On the day of filming we had two incidents where we would have had head on collisions, had we been driving faster. Be extra vigilant, blow your hooter as you enter a blind corner, drive with your headlights on and anticipate. There are four view/picnic sites on the southern ascent. If you are planning a picnic, the lowest site might be the most pleasant, as there is nearly always strong wind and cooler temperatures near the summit. The descent lasts for 10,3 kms and should take about 20 minutes to drive excluding stops. Although the pass carries the route number R328 it's administrative number is P0369. The second view site, named Skelmdraai is very good (if the wind is not blowing) with wonderful views and sufficient parking space for about 5 vehicles. From this site, there are excellent perspectives of Bain's propped up walls that run for 2,3 kilometres without a break. At the 18 km mark, there is a substantial ruin on the left hand side of the road (north), followed soon by a big picnic and view site. This is the last view site along the descent, if you intend taking a break. There are another four hairpins coming up, which commence at a ruin called Stalletjie, followed in quick succession by Witdraai. These start at the 20,4 km mark. Near the southern end of the Swartberg Pass looking west/ Photo: Thorsten KuttigThe road begins flattening out a little and the road surface improves as the foot of the pass is approached. After the last hairpin (which clears a side ravine), the road changes direction into the south and the road surface switches to tar at the 23,3 km point. The descent gradient remains reasonable and soon a large guest farm makes its appearance on the right hand side, which is Cobus se Gat. This is a good place to get some refreshment, reinflate your tyres and savour all the wonderful memories of driving the amazing Swartberg Pass. As you exit the final section of the pass and access the tar, you will be left with a feeling of awe, relief and disappointment all in one. Relief that you made it through without mishap and disappointment that it's all over. This pass ranks amongst the top 10 South African passes in terms of the total package. 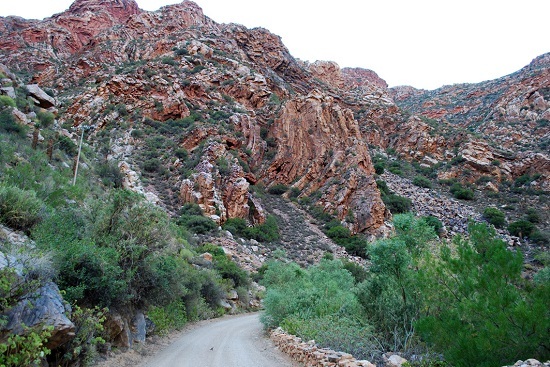 There are others which are higher, longer, sharper, more dangerous, but there is only one Swartberg Pass. This is the one pass you must experience at least once in your lifetime. 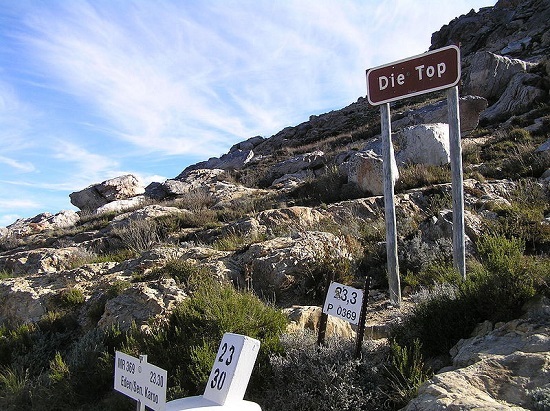 It leaves one with the sense that those responsible for naming the various points up the pass, had exhausted their creative energies by the time they reached the summit (1575m ASL) as the best name they could come up with was Die Top. It must have been a monumental effort. The pass is a national monument / Photo: GoogleHistory: Thomas Bain, with the help of some 250 convict labourers built the pass from 1883 to 1886. He managed to keep the gradient lower than 1:8 throughout the pass, compared to the steeper 1:6 of the Montagu Pass. Bain cleverly used the ridges of the foothills for a comfortable 'altitude gaining' approach to the looming bulk of the Swartberg range, where he chose the lowest saddle as his target. It was tough going and there are many stories that abound about the hardships endured by these pioneering men. When the crest of the pass had been reached during the second winter, a road builders camp had been set up close to the summit. After a particularly heavy snowfall, the roof of the camp collapsed, killing several of the convicts. By this stage of his road building career Bain had developed several unique techniques employing his knowledge of science. One was his dry-walling construction using the principles of cohesion and friction, using no cement at all. 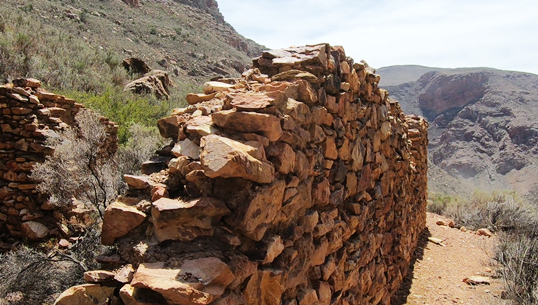 This technique was first brought into South Africa by John Montagu and Charles Michell and the first known examples of dry walling to support roads dates to the Montagu Pass (built by Michell) and Bainskloof (built by Thomas Bain's father, Andrew Bain). The other was using heat and water to break big rocks up. A large fire would be lit under or near a difficult rock and then cold water would be poured over it, resulting in the rock cracking into smaller, more manageable pieces. Thomas acquired most of these skills from his father, (and to whom he was apprenticed for a several years), who had an intimate understanding of geology. In these early pioneering days, the tools employed were very rudimentary and consisted primarily of picks, shovels, sledgehammers, gunpowder and hard labour. Zoom in and out; rotate in any direction. Use the Get Route'feature (directly beneath the map): type in your address to get a personalised route straight from where you are to the pass, with time and distance included. Detailed written and printable directions. Drag the 'little orange man' icon onto the pass for a complete 360° tiltable "street view".